On Saturday, November 20, at 7:30p.m. in St. Bede’s Chapel in Greenwich, renowned saxophonist Bennie Wallace will lead an eight-member jazz band in The Backcountry Jazz Fall Concert. 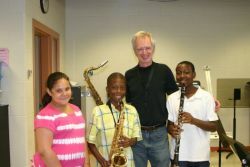 The band will perform well-loved Duke Ellington standards and other selections from the American songbook. The proceeds from the concert go to the non-profit organization, Backcountry Jazz, which funds music education and outreach programs in Bridgeport public schools with artists who teach and perform at the highest level of excellence. Six other musicians and jazz vocalist Hilary Gardner will join Bennie Wallace on stage. 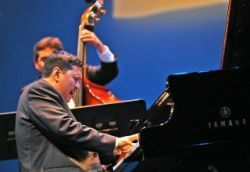 The concert will bring together musicians who have worked with legends such as Stan Getz, Sonny Rollins and Woody Herman, and younger musicians at the beginning of their careers – bass player David Wong is a 2004 Juilliard graduate and pianist Donald Vega won the 2010 Great American Jazz Piano Competition. St. Bede’s Chapel is located on the campus of Westchester Fairfield Hebrew Academy at 270 Lake Avenue. The campus is accessible from both I-95 and Merritt/Hutchinson Parkways. Parking will be available on the site. The concert begins at 7:30 p.m. Patrons received preferred seating with tickets available at $5,000, $2,500, $1,000, $500 and $250 levels. General admission tickets are $100. All tickets should be purchased in advance of the concert by contacting Backcountry Jazz at 203-836-9454 or jeanette@backcountryjazz.org. Wine, donated by Sonoma County’s Coturri Vineyards, and dessert will be served after the concert.